FALLEN LEAVES ON THE RIVER is a three story, chalet style cabin (built 1998), nestled within an 8500 acre mountain river resort. It is situated in a lush setting on the Coosawattee River in Ellijay, Georgia. And YES !!! This river photo is the front yard !! Rooms are charming and well appointed. Its hardwood floors and tongue and groove ceilings give you a warm feeling, while its two story stone fireplace provide you with warmth for those cozy nights. "Fallen Leaves" is great for a romantic getaway for two or a vacation for one or more families to get together. It sleeps up to 14 guests. We welcome church groups. The kitchen and laundry room are fully-equipped. We provide all the comforts of home... in fact, please make Fallen Leaves your home during your stay !!! Enjoy cooking out on the gas grill located on the second story deck, while listening to the rushing waters of the Coosawattee River or while simply admiring all the lush foliage that surrounds you. The game room is furnished for your enjoyment with a pool table and for the relaxation you so richly deserve, enjoy the bubbling heated spa. The game room takes up the entire first floor & can be used as a third bedroom, as it has a queen size bed & half bath. 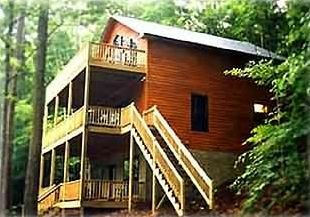 We know you'll fall in love with our Mountain River Hideaway. And yes, the river photo shown on this website will be your view every day during your stay at "Fallen Leaves." To view more photo's of "Fallen Leaves," please visit our additional website - see link below under "Links to more information," titled: "Mountain Cabin Rentals Website." 2-TV's, 2-VCR's, Stocked Video Library, 2 CD/Cassette Players, Hot Tub, Fully equppied Kitchen, Gas BBQ, three 10 x 28 decks, Picnic Table and large wooden swing on edge of river, Fallen Leaves has it own private little beach area! Right inside our resort, Tubing on the River, Recreation Center, Indoor Olympic Pool & Kiddie Pool, Video Arcade, Putt Putt Golf, Workout Room, Teen Center, Outdoor Pool & Kiddie Pool, Locally & Nearby, Canoeing, Whitewater Rafting, Pontoon Boat Rentals at nearby Carter's Lake, Antique Shopping, Train Rides (Blue Ridge Scenic Railway), & of course, Fishing right outside your door! !